I am someone who takes pride in being organized. From meticulously color-coding my Paper Source planner, to syncing the three calendars I maintain, and having about 62 tasks on my iPhone Reminders app to keep track of, I love keeping track of things in order to keep my head clear. If I make a to-do list for things to do this summer, I feel satisfaction from checking off a coffee place or art museum I just visited. I even write down when I exercised so I can look at the past month and note my (relative) fitness. Yet there are two aspects of my life that need a lot of improvement: my bedroom and my carbon footprint. Coincidentally, I have found that they may go hand-in-hand. As I have been cleaning my room after graduation, trying to emulate adult life and be organized before I start my job, I have had one main goal: minimalism. Taking magazine clippings off my walls, cleaning clutter off my desk and night table, moving furniture so it’s easier to walk through. I have found that the downside of being an organized person is that I have organized clutter; I’m so nostalgic about every year of elementary school, every high school play I was in, every city I traveled to when I studied abroad, that I have a room full of alphabetized or chronological things I can’t get rid of because they are tied with memories. Just as it’s difficult for me to discard memorabilia or minimize my belongings, it’s equally hard for me to cut back my un-ecofriendly habits and reduce my carbon footprint. While sorting through the umpteenth pile of middle school T-shirts or trying on a dozen of my mom’s old belts that don’t fit me, I kept on asking myself, “Can I live without this? How hard would life with me if I gave this up? Would I miss it tomorrow or realize it’s gone?” Often the answer was no (sometimes the answer was “maybe” or “let’s put it aside and consult Mom”). Those times that I put a whole pile of things into a shopping bag and removed them from my bedroom, I felt lighter — not only because I literally had less in my room, but because I also had fewer materials to worry about or distract me. Plus, parting with something that I may have once loved and not feeling sad or sentimental was incredibly empowering. I was practicing letting go and living simply. We have all given things away, whether it’s because we downsize for a big move, give hand-me-downs to a younger sibling, or sell a loved one’s belongings after a death or they enter a retirement home. It’s always hard, but we always make it through. If we can part with these materials that have meant a lot to us — these earthly things — what habits can we part with in order to benefit our Earth? For example, I love burgers and ribs and can never imagine myself becoming a permanent vegetarian, but what if I gave up red meat just for a few weeks at a time? An immense amount of water goes into the production of meat, and the consumption of certain types of meat emits as much carbon dioxide as our transportation. It wouldn’t be fun for me to give up red meat, but if I can part with the things that I cleaned out of my room, then maybe I can part with that as well. I used an old rolling pin from my kitchen to hang my necklaces from. I hate when they get tangled, and these necklaces are too large to hang on a small jewelry tree. Just put the holes in the ends of the rolling pin on two adhesive plastic hooks, and you can place it on the side of a dresser or armoire like I did! The fabric pinboard I had next to my desk only had a few photos hanging from it and wasn’t being fully utilized. I usually keep my earrings in a small bowl or dish, which makes it so hard to find a pair! Piercing my earrings through the ribbon crossings of this bulletin board (where papers and cards are often tucked in) has made it so easy to keep track of them and is much more aesthetic for color-coding or organizing earrings. Lastly, I also wanted to display my headbands like I did with my necklaces. Elastic headbands look great on a rolling pin, but also work well on a large glass bottle. Using a large Evian or Perrier bottle (or even a wine bottle! ), you can put your headbands on it and they will stack perfectly! You don’t need to go out of your way to find these items for organizing your jewelry and accessories, but I found these little ideas really helpful and almost refreshing. Instead of purchasing plastic or metal organizational pieces from Target or the Container Store, I used things I already have and re-purposed them. For me, this was a wonderful culmination of my “spring cleaning” saga and an encouraging example that I can cut back and be resourceful in other aspects of my life as well. We are two weeks into 2016, and while many of us are still saying “happy new year,” we’ve probably already fallen through on some of our resolutions. So far I have been maintaining my resolutions to floss more and to read one book per week; yet I made so many resolutions for myself that it’s difficult to keep track of all the ones I have to follow. While 75% of people’s resolutions will last through the first week of January, only 46% will make it through 6 months, the University of Scranton reports. What’s unique is that 39% of people in their twenties will achieve that year’s resolution, while only 14% of people over 50 will achieve theirs. Thus, our generation of “millennials” — people born between the early 1980s and early 2000s — are more capable of achieving their goals, if they put their mind to it. Go to the farmers market more often. What’s cheaper than eating farm to table at your favorite restaurant? Eating farm to fridge. Try to buy more of your groceries at a local farmers market; you’ll be surprised by the friendships you make with the vendors, and that you’re getting much fresher produce for your buck. Find a farmers market near you, here. Only drink from reusable containers. You can purchase a new CamelBak or Nalgene water bottle that will always be by your side, or an aesthetic thermos that transitions well from the cafe to the classroom. Over 1.5 million barrels of oil are used to make plastic water bottles each year. Try to swear off plastic water bottles and Starbucks disposable cups to save waste. Use public or shared transportation. Taking the bus may take more time to get somewhere, but it costs less and reduces your carbon footprint compared to driving. If public transportation is not available, even carpooling can drastically reduce the carbon emissions you produce. Shop with reusable bags. At the grocery store, CVS, or Target, try to remember to bring a reusable bag. Americans throw away about 100 billion plastic grocery bags each year. Not only does this number of bags require 12 million barrels of oil to produce, but plastic bags take 1,000 years to break down, posing problems for oceanic and land animals who encounter plastic infiltrating their ecosystems. Change your light bulbs. Using compact fluorescent lights instead of traditional light bulbs benefits you in more ways than one: CFLs last longer so you don’t have to replace them as often, you save money on your electricity bill, and they help you reduce the greenhouse gas emissions from your home (and lighting accounts for about 15% of total residential energy consumption in the U.S.). Go outside more. A great way to strengthen your resolve to keep these resolutions is to connect with the environment. Whether it’s hiking, taking your next vacation to a national park, or even going to your local park in the concrete jungle, try to immerse yourself more in nature. You’ll be relaxed, your day will feel more fulfilled, and you’ll have a deeper appreciation for nature’s role in your life. Watch more sunrises and sunsets. Looking at the sky each morning and evening is a wonderful way to begin and conclude your day. The beautiful colors of each sunrise and sunset remind us of God’s wonders and the awe of his Creation. By starting and ending your day with the sun, you are reminded of the light nature (literally) brings to our lives, and the importance of Creation care. There’s something inspiring about the new year, and even though we are halfway through January, I hope that you still find the spark to ignite new initiatives and find the flame within you that wants to try new things. Being green should definitely be one of them. Starting in nursery school, children learn to equate plants with water. In the “Garden Song” — a 1975 children’s song made famous by John Denver and Pete Seeger — the lyricist is planting a garden, and “inch by inch, row by row, [they’re] gonna make this garden grow. All it takes is a rake and a hoe and a piece of fertile ground.” But what if you live in a region of the U.S. where you don’t have fertile ground? What if you can’t wait “’til the rain comes tumbling down” because you’re living in a drought, or experiencing a water shortage? On average, an American’s “water footprint” is 32,911 glasses a day, according to the Nature Conservancy. Ninety-six percent of that water is “hidden” water, used to grow and make your clothes, food, and generate energy for items of daily use. If Americans don’t alter their style of living and water consumption, that’s 751,777 gallons of water used, per person, per year. But before you alter your diet and buy a new wardrobe, a great way to practice saving water starts with your garden. 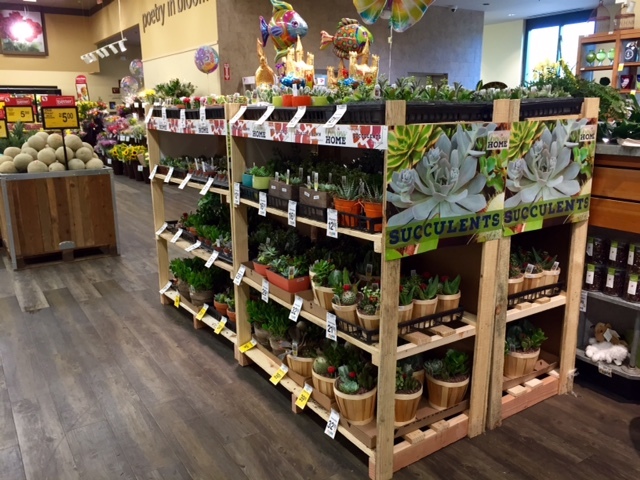 Succulents for sale at the Safeway grocery store in Georgetown. In places like California, where residents are redesigning their yards to abide by the state water restrictions, plant stores and nurseries are seeing increased sales in succulents, mulch, and pottery, and fewer purchases of roses, bedding, and tropical plants. As of earlier this summer, almost 3,000 Angelenos and 60 LA companies had ripped out their lawns to partake in the state’s rebate. The Metropolitan Water District of Southern California offers a rebate of $2 per square foot of turf removal. Los Angeles Mayor Eric Garcetti said to California Governor Jerry Brown, “I can report that with only 10% of the state’s population, Los Angeles will reach half of your entire statewide goal by the end of this year,” the LA Times reports. LA’s progress in water conservation shows the impact that residents can have on a larger environmental scale. With only 10% of the state’s population, Los Angeles will reach half of California’s statewide water goal by the end of this year, thanks to the rebate for turf removal. If you are a resident of California and want to join in making a difference, a great place to get started is the “California-Friendly Guide to Native and Drought Tolerant Gardens,” featuring aesthetic photos and detailed care instructions for flowers and plants that can serve countless benefits to your yard. There are a number of sites featuring great drought-tolerant plants, and a number of vibrant drought-tolerant perennials that will not only last in your garden for a few years, but also add a lot of color. There’s a misconception that less water-intensive plants are lackluster, but if you visit these sites and drop by your local plant store, you would be surprised how beautiful drought-tolerant plants can be. An indoor arrangement of succulents, by Patricia Berl; perfect for home decor or entertaining. Once you perform some feng shui in your yard and make it more water-friendly, you will realize how much you don’t miss watering your yard, and you’ll likely want to bring water-friendly plants inside your home. Succulents and terrariums are very trendy as indoor plants, and they require water very infrequently. My neighbor Patricia Berl arranged this beautiful centerpiece on the left, featuring some of the drought-tolerant plants mentioned earlier. Patricia also uses artichokes (you can buy them really cheap at Trader Joe’s) for a chic arrangement for the dinner table; it’s perfect for summer and only requires water every few weeks. Plus, if you’re traveling, you don’t ever have to worry about watering your indoor plants! 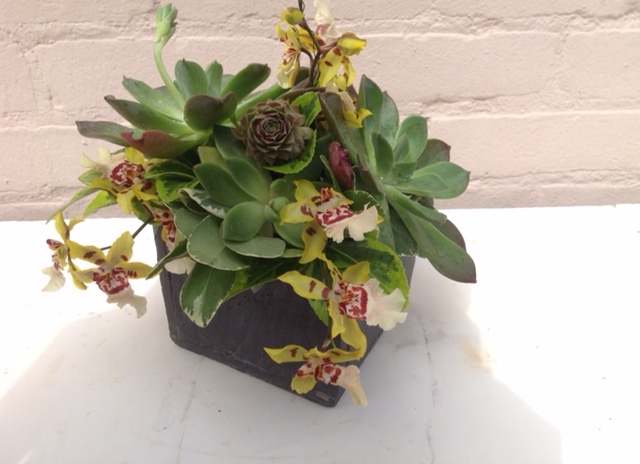 You can follow Patricia’s Tumblr, Patricia Berl Flowers, to see more water-friendly arrangements. According to the EPA, only about 14% of plastic bags/wraps are recycled in the United States, and recycling this type of plastic requires more energy than recycling plastic bottles. In order to combat the amount of plastic bags in landfills or littering streets, many cities are banning them or charging a bag fee (or sometimes both). Many stores sell their own reusable bags, which are often heavy duty and made from recycled plastic bottles. If you are like me, there are many old t-shirts around your house begging to be “upcycled.” Here is a perfect, easy project! One thing I love about this DIY is that it only involves an old t-shirt and a pair of scissors and it requires no sewing! I made this bag in ten minutes and it is especially perfect for produce rather than using the plastic bags the grocery store provides since this bag is 100% washable. First, you need only a large old shirt and a pair of fabric scissors. Cut the arms off (including the seams) and cut a large hole around the neck. Next, you need to create fringe at the bottom of the shirt. Turn the shirt inside-out if you want your finished bag to show the design of the shirt, or leave right-side out if you would rather your bag be plain. Cut strips of both the front and back of the shirt together about 2-3 inches long. Then you will need to tie knots in the fringe. This is a two step process – the first is to tie the corresponding pieces of fringe in knots. Once this is done, go back along the fringe and tie diagonal pieces of fringe in knots in order to prevent small gaps along the bottom of your bag. When you turn the bag right side out (so the fringe is inside the bag) you can check for additional gaps and tie those up. If you do sew, put a simple seam along the bottom before turning right-side out and you can skip the fringe tying. Voila! Your reusable bag is ready to go to the store with you. If you decide to use it for produce, wash every few uses. It’s not as heavy-duty as most reusable bags so I don’t recommend it for cans or heavy groceries. 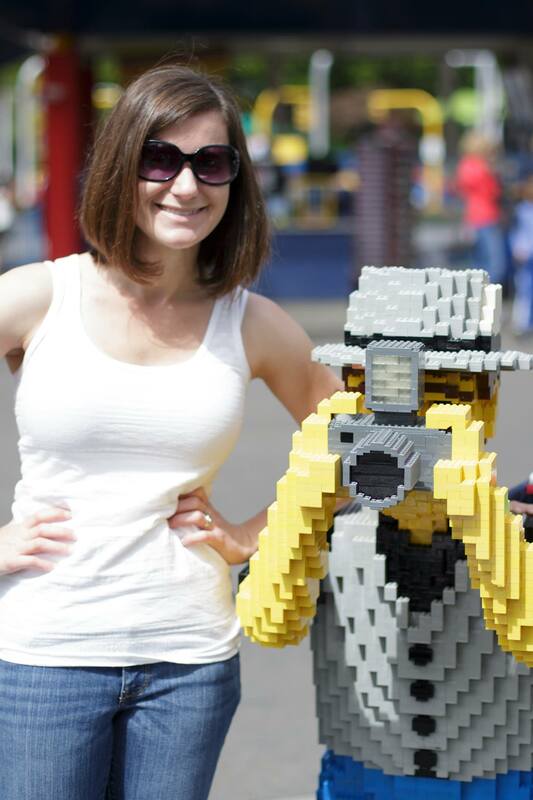 Krista is a biology professor, photographer, and mother of two. When she isn’t teaching Biology 106: Principles of Biology at Pepperdine University, she is taking professional photos of family and friends for her business, Krista Lucas Photography. Those stars mean everything to me. I don’t know why having Gold status for Starbucks Rewards makes one feel so entitled, but spending $4.25 on a grande iced chai tea latte seems worth it when a little gold star pops up on your Starbucks app’s account history. Like most millennials, I go to Starbucks about two or three times a week, often for a caffeine pick-me-up during dreary college days, or to chat with a dear friend over coffee. I can down my iced latte in a matter of minutes, but what about the plastic cup I throw away after? How long does it take for that waste to be disposed of? While our Starbucks drinks are ephemeral and our addictions harmless, the waste of our paper and plastic cups is permanent. The author’s personal thermos with the Starbucks adhesive label; at the Starbucks in Georgetown. For the first time the other day, I brought my own thermos to my local Starbucks. I was expecting the barista to be annoyed or inconvenienced, but without a moment’s hesitation she pulled out a small sticker to adhere to my thermos, and labeled my drink order on the sticker in sharpie. A few minutes later, I had my drink, and knew it was mine and no one else’s because of my personal thermos. 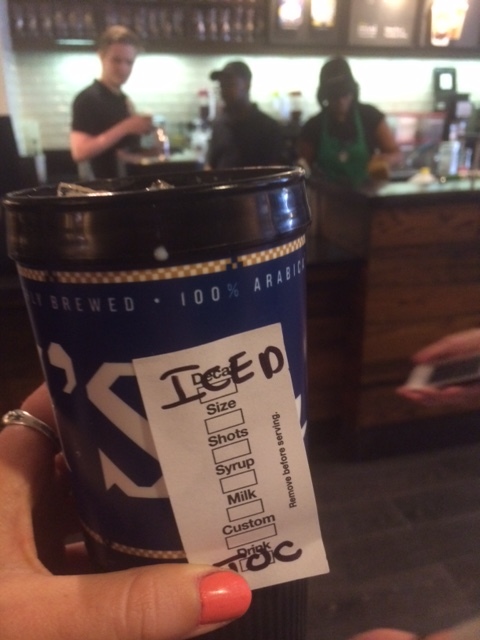 (If you’re someone plagued by Starbucks misspelling your name, perhaps bringing your own cup is a good way to avoid them butchering your name on your plastic cup every visit). Starbucks is a huge advocate of customers bringing reusable cups, even though they have not had much success. The Seattle-based company’s original goal in 2008 was to serve 25% of beverages made in their stories with reusable cups in 2015, but their current goal has been decreased to a mere 5%. Why the change? Because, since 2011, only 2% of beverages made in the company’s stores worldwide have been served in reusable cups. Granted, that still totals to 34 million times, but that also means that 98% of those beverages were served in paper or plastic cups. An infographic from Starbuck’s environmental stewardship initiative featuring reusable cups. While it may not seem like 2% of beverages is a large quantity, those 34 million times a customer drank from a reusable cup have saved over 1.5 million pounds of paper from landfills. Thus, try to hone this habit of bringing a reusable cup to Starbucks whenever you go. Not only can it benefit the environment by minimizing waste, but it also helps the Starbucks company try to achieve their long-term goal. Plus, to incentivize the customer, Starbucks let’s you save 10 cents every time you use a reusable cup instead of paper or plastic. Every dime adds up! Every New Year’s Eve, Americans await a brand new year — a clean slate — for them to accomplish the resolutions they have set. However, while 75% of resolutions will last through the first week of January, only 46% will make it through 6 months, the University of Scranton reports. What’s unique is that 39% of people in their twenties will achieve that year’s resolution, while only 14% of people over 50 will achieve theirs. Thus, our generation of “millennials” — people born between the early 1980s and early 2000s — are more capable of achieving their goals, if they put their mind to it. This is the first of a weekly feature called Hone this Habit. Like New Year’s Resolutions, this segment will introduce simple steps you can add to your daily routine to reduce your carbon footprint. For example, start to unplug. Unplugging your chargers and appliances from outlets when you aren’t using them, are out of the room, or are traveling, is one of the easiest habits you can adopt. Purchase a power strip. Some can fit up to 8 or 10 outlets, and with the flick of a switch, all of the plugs will stop consuming energy. It’s easy to do on a daily basis, and guarantees safety if you’re traveling and are worried about old wires or electrics being on. Decide which electronics you use and don’t use. A lamp on your night table or desk you may use on a daily basis, but a stereo or DVD player cord can probably be unplugged. Practice powering down. Instead of leaving electronics on sleep mode, or keeping them plugged in when they’re fully charged, be mindful of how long something has been charging, or think of when you will be using something next. If your cell phone is at 70% charge, keeping it plugged in overnight is not practical: it will only take a few hours to reach 100%, not an entire night, plus overcharging can exhaust the battery and shorten the lifespan of any electronic. Start today and try to hone this habit in a week: Unplug!